I don’t have a mantel, but I do have a shelf, and some spring mantel envy. As soon as the weather warms up I get the spring cleaning itch, and part of that is prettying up the house. I see so many gorgeous mantels on Pinterest, but to me they just look like they’re too fancy for my house. I have kids and I want to proudly display my kid art. My vignette has more of a “lived in” look. It was made with found items, cheap crafts, thrift store finds, and dollar store purchases. Going counter-clockwise from there, the second thing I have is tissue paper butterflies from Obsession with Butterflies. We also have these hanging from the ceiling. Even the one year old liked helping make these, picking the colors and rolling the antennae. The frame is from the dollar store. Third we have a free printable about spring. 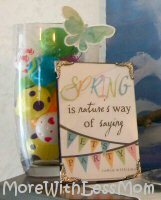 The quote is: “Spring is nature’s way of saying let’s party” by Robin Williams. There are a couple versions of this quote on Pinterest. This one is from Landee See, Landee Do. The frame is from the dollar store. Behind the print is a dollar store vase with some dollar store plastic eggs, I chose bright colors because I knew my kid art would be bright. No need to fancy up the eggs. In the center is a nest for less than a dollar at the craft store. In it are malt candies from the dollar store that look like eggs. It is on a dollar store metal tray. Under that is a hankie I got off eBay for $1.34. The fifth thing I have is a styrofoam ball we covered with feathers and added googly eyes. My 3 year old really liked making this – what kid doesn’t like getting glue everywhere? On the right is a bird’s nest. I hot glued a candlestick and a tea light candle holder that looked like a flower, both of which came from a dollar store. 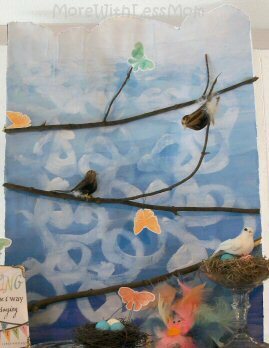 The nest is spanish moss from the dollar store. 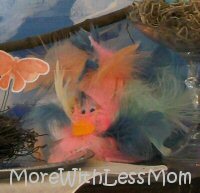 The bird was from the craft store for less than a dollar. Under the shelf I stuck some tissue paper flowers my older daughter had already made. The littles will soon be making some colorful flowers to put here from Martha Stewart. I have another print on display. 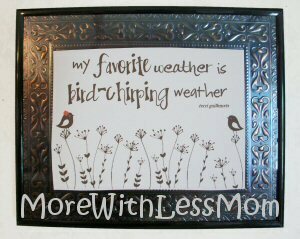 “My favorite weather is bird-chirping weather” by Terri Guillemets, which is from Such the Spot The frame is from the dollar store and the brown swirls were on the print so I just taped my printable on the glass. 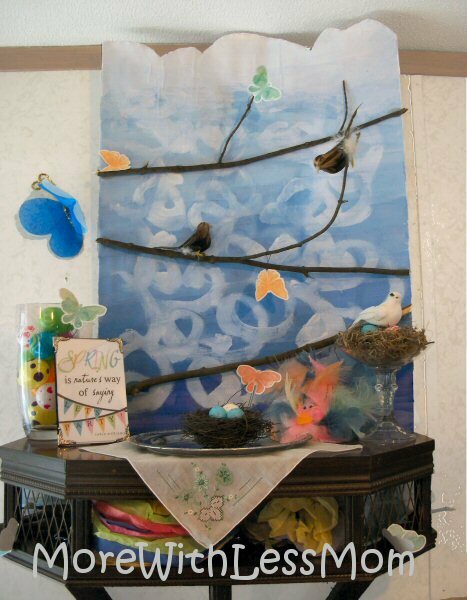 I have already added some kid art Easter eggs from tin foil covered cardboard and tissue paper pieces found on Happy hooligans. The dollar store had some tissue paper in pink zebra and leopard print and they make some really festive eggs.